That's right... I'mmmm baaaaccck! I have a little jewel here to share - this is something I've not done before. An ATC. I know big deal, it's just a little card instead of a big one (it's only 2.5x3.5). Well, when you're getting old and have to wear cheaters to color small things it is LOL! I enjoyed it though. 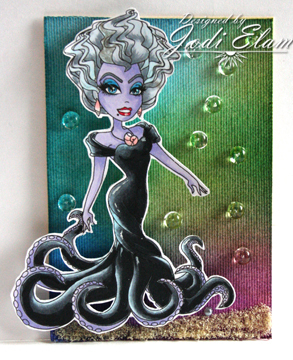 I call her "Hot Ursula", but she's really Ursula Pin-Up. I inked some Sticky Back Canvas with Distress Inks for her background, used some fine Flowersoft for the sand and small clear Dew Drops for the bubbly bits. Anyone want to trade? 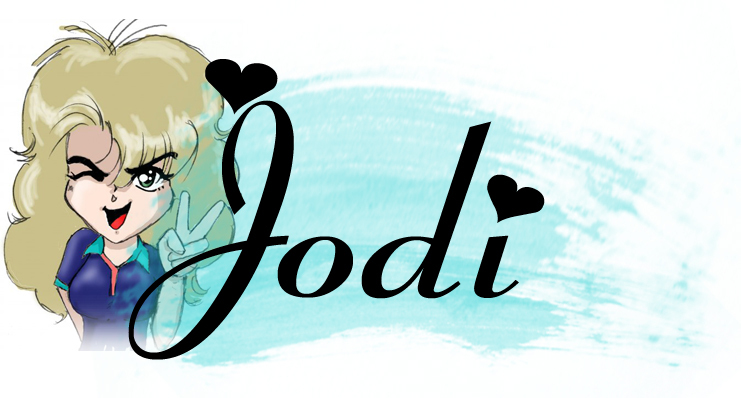 Jodi, this is just gorgeous! Love how you did the background...it's fabulous! Wonderful coloring as well. I absolutely love her. The background is incredible. I will definitely have to try this. What a FAB ATC, who would have thought it was your first?!! Thanks for joining us at Wicked Wednesday this week. Wow this is great! Love the SSD image!! Thanks for linking up to Wicked Wednesday!! She has a sinister look to her! Great artwork! 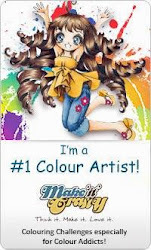 Hi there, oh wow she is just amazing - as is your colouring! Fabulous ATC. Great ATC, love that image. Thanks for playing along with The Cheerful Stamp Pad. Love the curvey image! Thanks for joining us at The Cheerful Stamp Pad. 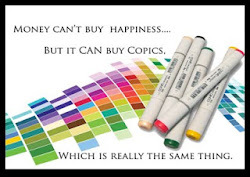 Great ATC - love that image and the way you've coloured it. First off I would like to say wonderful blog! I had a quick question which I'd like to ask if you don't mind. I've had trouble clearing my thoughts in getting my thoughts out there. I do enjoy writing however it just seems like the first 10 to 15 minutes are usually lost simply just trying to figure out how to begin. Any recommendations or hints? Cheers!